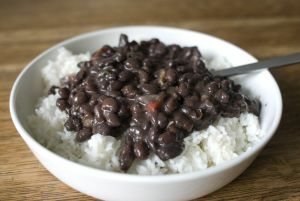 Latin Black Beans is a Venezuelan food recipe called Habichuelas Negras. In a medium sized saucepan, heat oil over Med/Hi heat. Add garlic, onion and green bell pepper and saute until tender. 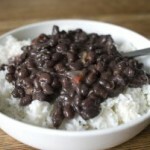 Add beans(liquid from beans as well), 2 pks of sazon, oregano, water and sugar. Stir it all up and increase heat to High. Once boiling, lower heat to simmer for about 30 minutes. Add cap of vinegar and stir.